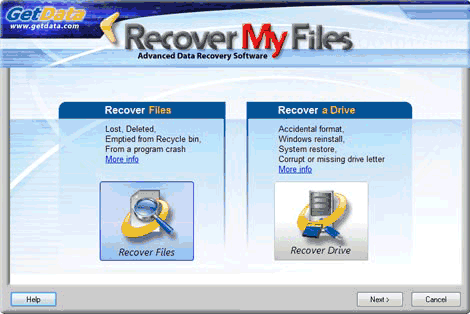 Data recovery, Recover My Files quick start guide. What type of search should I run on my computer with Recover My Files? When you start Recover My Files data recovery software using the desktop icon, you are presented with a wizard screen that provides two data recovery options, "Recover Files" or "Recover Drive". try the "automated" mode first, as it is configured for the best and fastest search on most systems. files have been lost by some other unknown cause. To search for deleted or lost files, click the "Recover Files" button then "Next" to proceed. (NB: If your data loss problem relates to loss of data from the entire drive, select instead try the "Recover Drive" option). or some other problem has effected the entire contents of the drive.